Hey good lookin’, I got chicken cookin’! Check out this gorgeous dish. It has to be one of the most visually appealing recipes that CookingShorts has created yet and one of our favorites. This recipe can take your taste buds on a Mediterranean vacation. It’s herby and salty, plus the lemons add the perfect citrus note to the sauce that makes this dish pop. Slow cooking the chicken in the dutch oven makes the meat very tender. Yum! We can’t wait to make it again. Pat the chicken dry and season well with salt and pepper. Add olive oil to a Dutch oven, heat over medium heat. Melt butter into the oil and add chicken. Brown the drumsticks on all sides. Remove chicken from the pot and set aside. To the remaining oil, add the onion, ginger, turmeric, cinnamon, and cook until onion is translucent, about 3-5 minutes. Season with salt and pepper, add the garlic, and stir to combine. Deglaze the pan with chicken broth, making sure to scrap up all the bits off the bottom on the pot with a wooden spoon. Bring to a boil and add chicken back to the pot. Add in lemon slices to the pot. Reduce heat, cover, and simmer gently for 45 minutes. When 5 minutes of cooking time is left, add in olives and parsley. 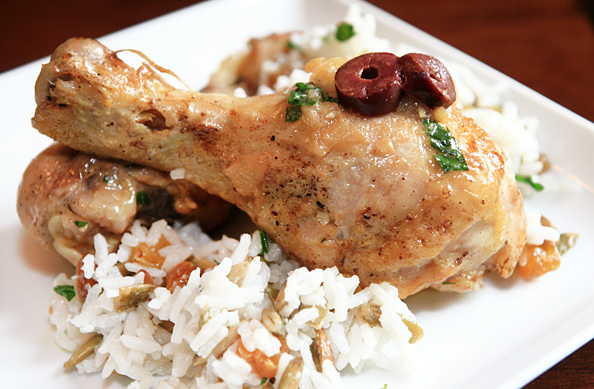 Serve with my amazing Mediterranean Jasmine Rice with Nuts and Raisins - enjoy! Great review and really full of information. Here’s an idea that bbq specialists can make use of to smoke or bbq a lot of the most succulent barbeque out there. If you’re having trouble with your meal dehydrating on the barbecue smoker or propane grill, try this step to promptly improve your barbeque. Whether you’re cooking ribs, chicken breasts, or any other meat, shower it using apple juice to keep a higher moisture content degree on the food. A lot more moisture means your dinner may be a lot more juicy and tender on the dinner table. MMMMM barbecue.